Borderlinx | Buy iPad and ship worldwide with Borderlinx. Cheap rates guaranteed. The iPad is a line of tablet computers by Apple, Inc. that debuted in April 2010. Since then, Apple has released several new generations of the iPad, including iPad Mini, iPad Air and iPad Pro models. With an iPad, you can browse the internet, send and receive email, take photos, shoot video, check GPS navigation, play games and use applications, also known as apps, for millions of other functions. Every day, millions of professionals, students, adults, teens and kids around the world use the iPad. The new iPad Pro offers more power than most PC laptops. The redesigned retina display and advanced operating system make this the perfect tablet for any professional. The USA iPad Pro starts at $646 and comes in four different color options. If you travel a lot, you may prefer the iPad Mini 4 for its ultra-compact size. You can choose different finishes and even cellular connectivity. The latest USA iPad Mini starts at just $399. 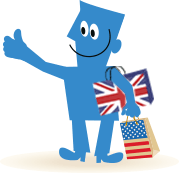 Now you can buy iPad in the USA and ship to your home country the easy way with Borderlinx. Calculate shipping fees, including tax and duty, before you with our Shipping Cost Calculator. Borderlinx services make international ordering from iPad USA hassle-free, including concierge, free repacking and package consolidation.